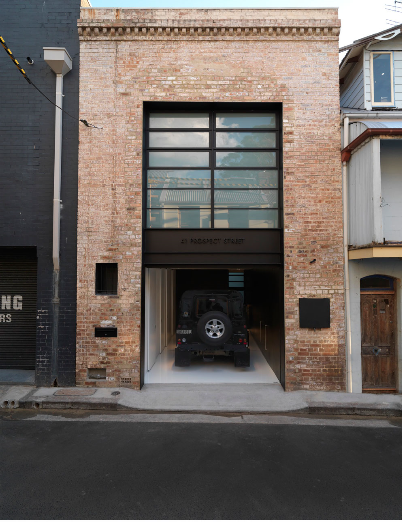 Located in Surry Hills, this warehouse conversion was designed by Ian Moore Architects in 2010. Originally built in 1895, the former grocery warehouse was heritage listed and as a result, the City of Sydney had a number of design requirements and restrictions. The architects were required to strip paint from the facade in order to reveal its original brickwork and were prohibited from removing any of its original exterior. They also needed to maintain or reinterpret the warehouse’s street number sign which was considered an integral part of its character. The warehouse had already undergone numerous modifications over the years. In the mid 20th century it had 35 years of use as an engineering workshop before being converted to an artist’s studio and then a residence in the 1970s. The client requested four key design features for her new home. It had to be black and white, feature a well-lit bathroom, accommodate her large Doberman and provide an appropriate setting for her collection of black and white photographs. 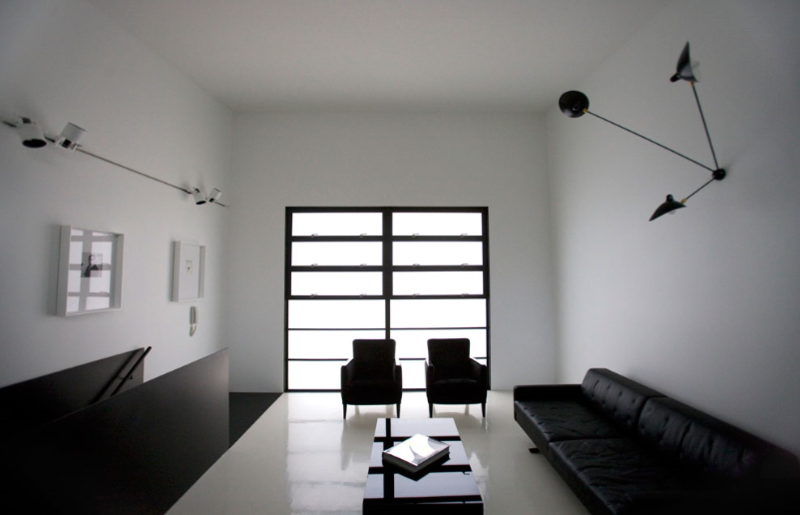 The end result was a two-level residence within a contemporary warehouse. With the two street frontages, one for pedestrian and the other for vehicular access, the architects maintained the proportions of the original facades but used modern materials and composition to bring the house into the 21st Century. On both frontages, sleek black steel beams and columns replace the warehouse’s timber frames, a look inspired by the industrial past; providing texture and a visual separation between old and new. The new front door is located in the former loading dock at the end of a quiet cul-de-sac, adjacent to a heritage listed sandstone wall. 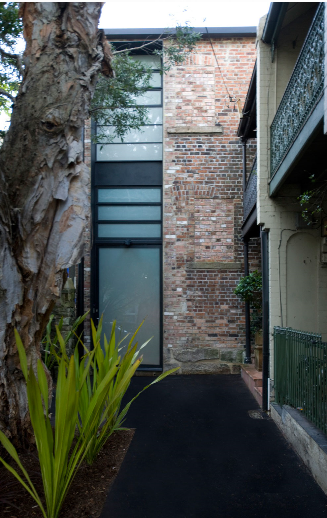 The entry is defined by a full height steel plate portal, irregular original window openings and recycled brickwork that make up this façade. Internally a 1.7 metre height difference between the 2 streets is utilised to create the tall volume of the living space, with its’ floor to ceiling wall of books. Any element retained from the warehouse has been lined and painted white while new elements have been painted black. Light plays an important role in the composition and quality of spaces. Together with the house’s monochromatic palette, thoughtfully placed double glazed windows bring spaces together through light and shade and create a sense of fluidity through-out. At the pedestrian entrance, a modest set of black stairs lead to an open living space consisting of a living room and dining area that sits below an overlooking kitchen on a mezzanine level. While accommodating the site’s slope, the double height living space and mezzanine level welcomes light deep into the building. 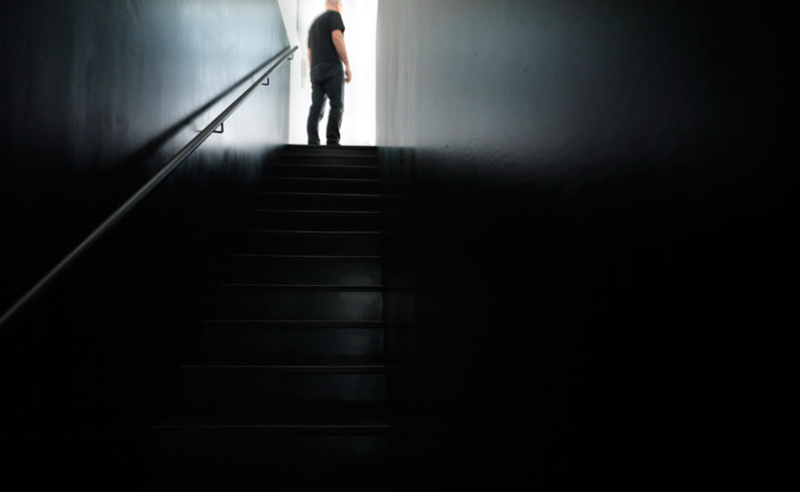 Adjacent to the kitchen, a full set of black stairs follow the axis of the pedestrian entry. Every joint and detail of the staircase is finished in black, exaggerating the whiteness of the light filled space in the upper level. 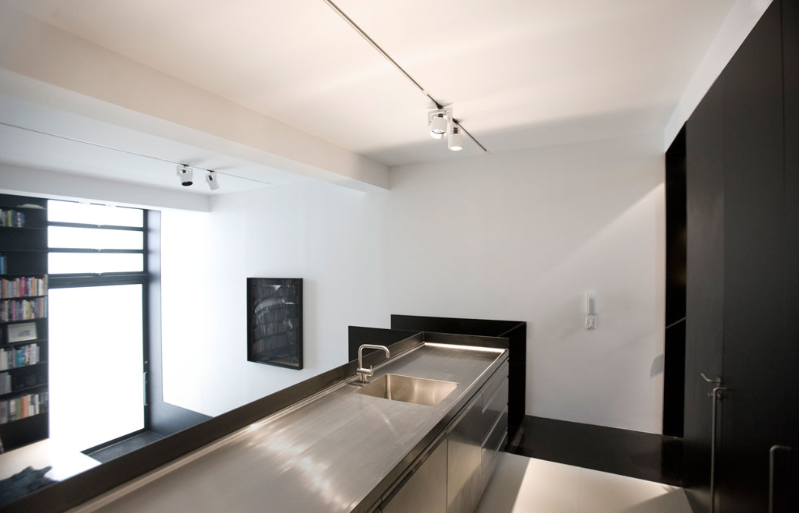 The upper level is mostly open-plan, with a singular black volume at its centre containing a bathroom. 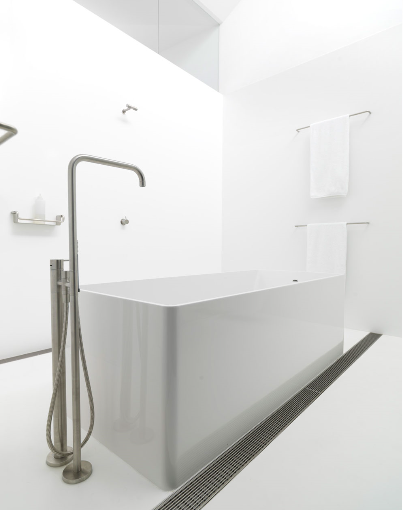 The bathroom’s walls are glass where it meets the ceiling so that light flows from one side of the house to the other. Inside, white walls, fittings and a vast bath tub are further illuminated by high clerestory windows. In this case the new highlights the beauty of the old. An impressive example of modern heritage!